Consolidate your institution's brand by delivering a complete social learning experience with GoConqr Campus. 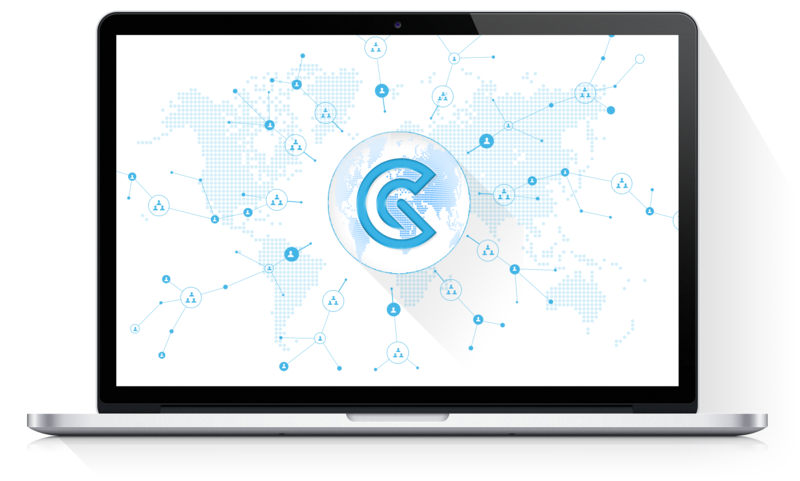 Imagine having a branded institution environment tailored to meet your specific requirements and enable the creation of unlimited educational resources. Empower your staff and students by giving them access to a range of digital tools for content creation. 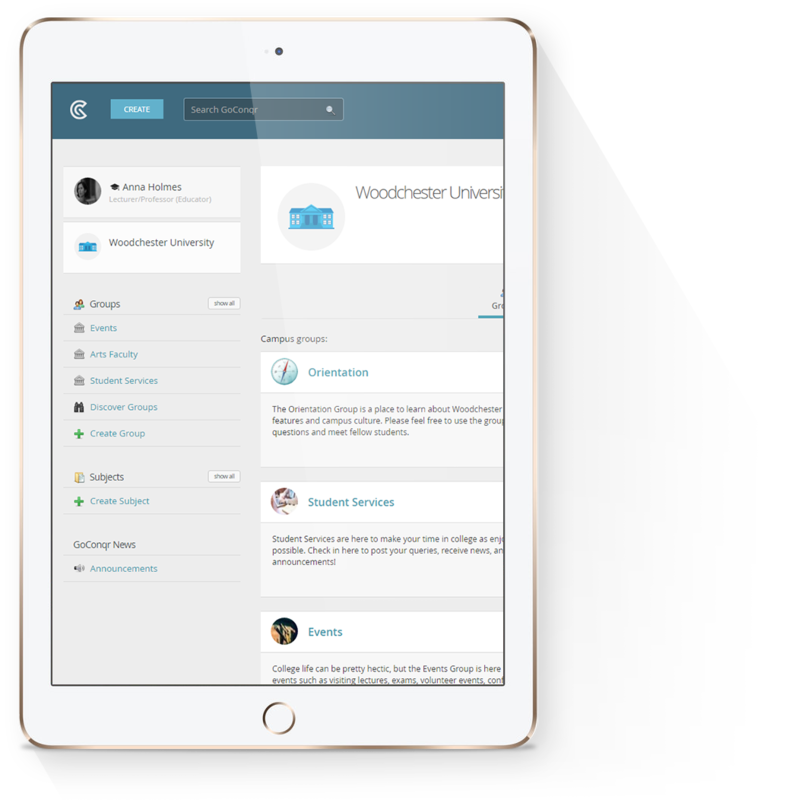 Manage groups, reports, exclusive content and access levels to tailor the best experience to them in your own Learning Management System. GoConqr Campus is an easy-to-implement platform that’s a perfect fit for institutions looking to improve students’ learning experience. Our powerful digital technology offers users instant access to resource creation and sharing tools, allowing you to build your own digital library and fill it with content that’s exclusive to your students and collaborators. Create a collaborative environment for your students. Empower them to produce knowledge and content. Create unlimited learning resources. Monitor one-to-one engagement and performance. Administer groups and engage in discussions on relevant topics. Implement your class strategy in a private and secure environment. Provide all the learning tools your students need to take a more active part in their learning experience. Share resources with groups of learners or with specific students. Concentrate all learning activities on one integrated platform. Receive personalised group and individual reports for faster and more fluid performance tracking. Expand your reach by sharing your content with non-members via Smart Links. A single platform that combines creativity with productivity. 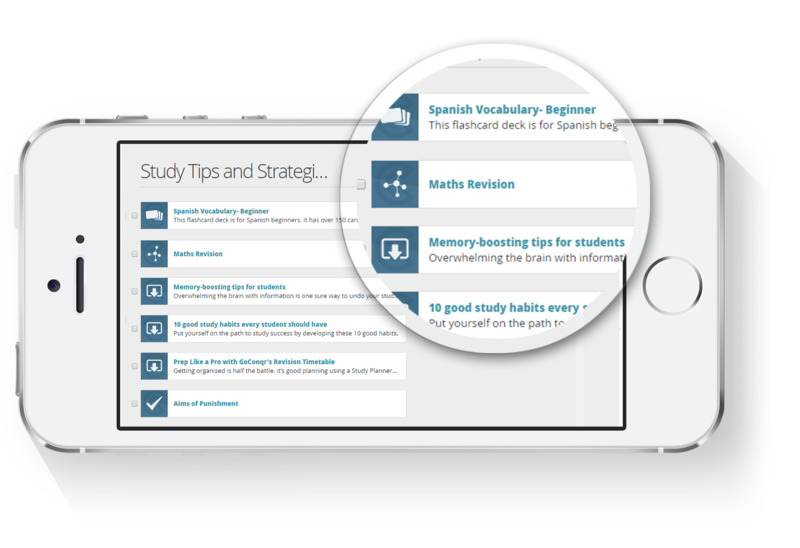 Easily integrate multiple resource types into lessons. Set quizzes and tests for different groups of learners. Take full control over who can access your content with our Learning Management System. View, copy and edit millions of user-created Mind Maps, Flashcards, Quizzes, Notes, and Slides on countless topics, or create a library of your own by making the resources you create accessible to approved users only. Sign up, set up and get started in just minutes. No coding nor tech support required. Adding users and organising your content in GoConqr Campus is as simple as ever. With an extremely quick and easy set-up, you can organise your students by specific groups, arrange content in subject folders, and control access levels with GoConqr Learning Management System. Access Group analytics to track users’ engagement levels with shared resources and discussions. Get a comparative overview of students’ attempts, grades and engagement. Monitor activity levels with our Learning Management System to optimise your content delivery strategy. 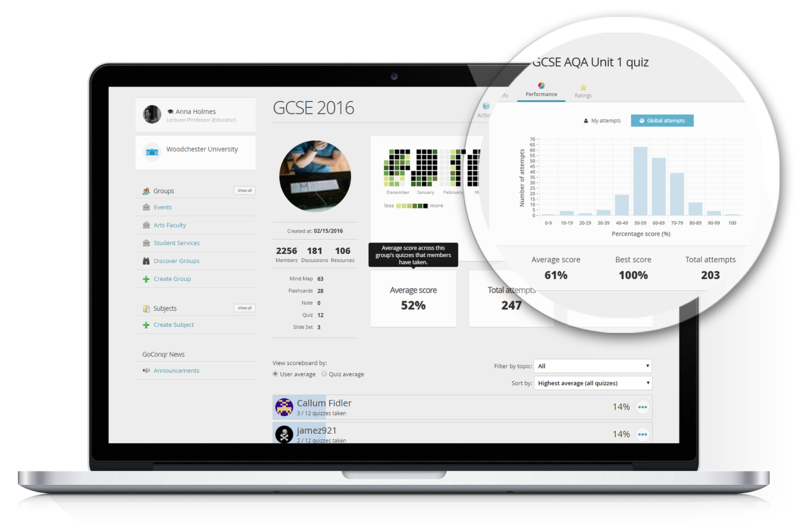 Analyse general quiz scores and users’ performance on specific questions. Check how many times a resource was accessed and by whom. 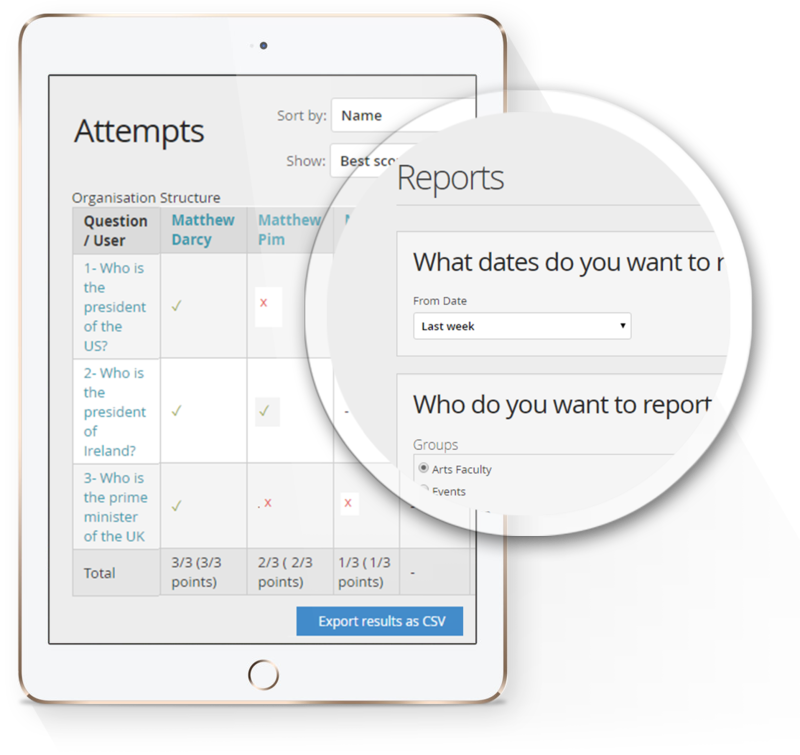 Run detailed individual user and resource reports to gain actionable insights into student progress and content effectiveness. SmartLinks let you share content with non-users without granting access to your Campus environment. Keep track of each student’s unique progress in order to identify where their needs lie and tailor your content to meet them. Looking for benefits for companies?